I am fine and I hope you are doing fine too. It’s been ages since I have seen you and I am really mad at you for that. I know that I didn’t prove to be a good friend when financial problems struck you but trust me when I say I was helpless. Lack of qualifications in your CV is the basic reason that I couldn’t help you find a better job that would suit you and your family needs. I want you to enroll yourself into Masters in Engineering Degree Program. I know that you’ve been out of your academic posture for quite some time now and you’re a little rusty but it will all be good with time. The main reason I am asking you to enroll yourself in the Engineering program is to raise your qualification up to a level from where there is no coming back. Being a Masters in any engineering field is something worth both your time and your money. Although you won’t experience sudden career hiring right when you’re done with your degree but soon enough you will surely experience a change in your career development approach. Being an Engineer comes with a lot of opportunities and a river of career choices and I think that it’s best for you too to settle down in one career now. I hope that you will find this letter compelling enough to enroll yourself in the Master’s Degree Program and a make a living out of it. Waiting keenly for your positive response. Sample rejoining job application letter as engineer, mechanical engineer, chemical engineer, electrical engineer, instrument engineer after once you resigned from the job due to higher studies/education or any other reason. I hope you are doing fine. I have been a part of this company in 2014 as an engineer and it was great experience working with you. I have to resign from the company because I left the city to study a course in Chicago. I have completed my course there and now ready to be a part of this company again. I have learnt a lot during the course I studied which was directly related to my field and positive about putting a lot effort more than I did previously. I am faithful to perform well and make this company proud. I am very optimistic that you would be giving me a chance again to show my abilities. My past working experience with this company is an evidence of my hard word and capable of doing my job well. I would be glad to become a part of this company once again. I will be thankful to you. With due respect, it is stated that I had been working as civil engineer in your construction company. I had taken a study leave for one year to increase my qualification. I was abroad and I have just returned yesterday. I have passed the exams for my additional diploma. Hence, I am writing this letter to rejoin your company as an engineer again. I assure you that with new skills I have learned I will offer a huge boost to the progress of company. Please inform me if you take my application into consideration. A job application letter from a production engineer, worker, supervisor candidate to the firm manager, requesting him to offer him the job based on his good educational and professional background. I have come to know via newspaper that a position for the executive engineer has been vacant in the production cell of your company. I always wanted to work in your company as I know it provide one the best chance to polish his skills and to flourish in the best professional environment. I think I am a perfect match for this post. I am sending my resume along with this application. My qualifications are quite appropriate to your requirements. I also have 8 year experience as an engineer in production cell in Steve Garments. I will prove the best for your company if you allow me to use my skills for the company. My name is Jon Snow. 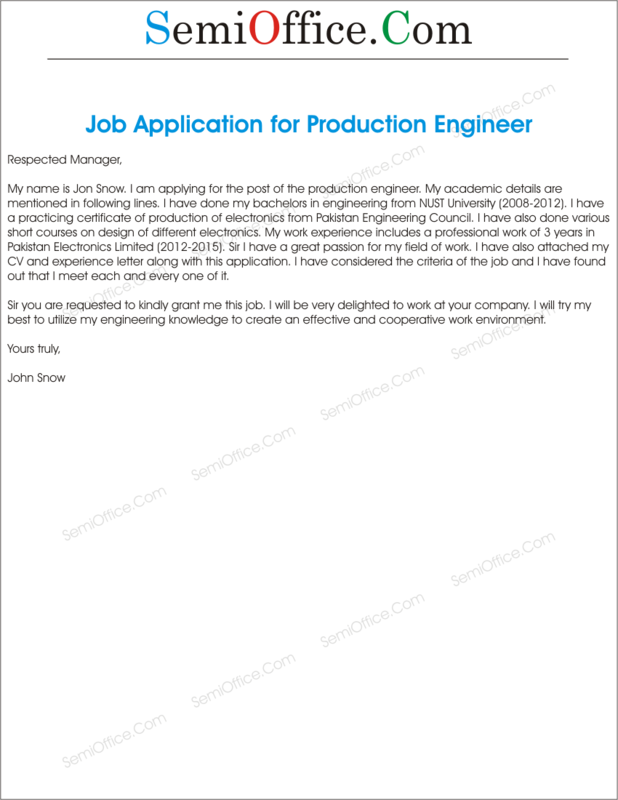 I am applying for the post of the production engineer. My academic details are mentioned in following lines. I have done my bachelors in engineering from NUST University (2008-2012). I have a practicing certificate of production of electronics from Pakistan Engineering Council. I have also done various short courses on design of different electronics. My work experience includes a professional work of 3 years in Pakistan Electronics Limited (2012-2015). Sir I have a great passion for my field of work. I have also attached my CV and experience letter along with this application. I have considered the criteria of the job and I have found out that I meet each and every one of it. Sir you are requested to kindly grant me this job. I will be very delighted to work at your company. I will try my best to utilize my engineering knowledge to create an effective and cooperative work environment. 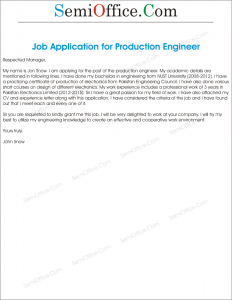 I am writing to you because I would like to apply for a production engineer job. I saw online that you have a position open. I have the relevant experience from when I was working with a different production company. I left that job due to me being treated wrongfully. What happened was there was some camera equipment going missing and because I am different they blamed me. I was also being discriminated against by some of the managers and so for that reason I left. I am a very good hard worker and I like to get things done neat and clean and as quickly as I can. Some people in my life have told me that I am not the right person for this kind of job and that I won’t make it in the production industry. So I am very motivated and determined to prove them ll wrong. I hope that you will give me a chance and I look forward to hearing back from you with your reply. 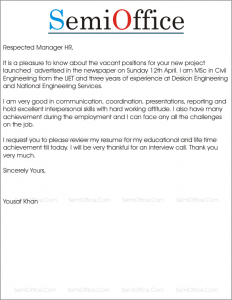 Sample cover letter for mechanical engineer available for free download to send engineering resumes and to apply for engineering jobs advertised in newspapers, on websites, classifieds or on notice boards. Hope this letter will find you good. In response you to engineering jobs advertisement for fresh engineers I am pleased to send my resume with educational documents. Recently I completed MSc Engineering from UET with 3.9 CGPA. As per job advertisement I assure you that you will find me most suitable candidate for the vacant positions. I have three months of internship experience from NES which was a part of my degree. I am very talented, committed and rich with knowledge to start my career as mechanical engineer. I request you to please allow me to appear in the interview and test. I will be thankful to you. I would like to apply for the role of Fresh Mechanical Engineer as advertised on Jang Newspaper on 10th July, 2017. I have been graduated in Mechanical Engineering from University of Engineering and Technology, Lahore since June 2017. The four years degree program in this institute, provided me an opportunity to groom in an effective manner; the way how to set your goals and achieve your targets; a platform where you can change orthodox mindset into productive thinking and curricular as well as extra-curricular activities help me to enhance pragmatic knowledge and boast my confidence. Moreover, during the Engineering, I also get a chance to do internship in two industries, where I learn how theory applies into system for optimizing the output; the technique which is used to design a particular product; the interaction of higher hierarchy to middle and middle to lower level and a complete web of different departments which are aiding each other in order to improve the efficiency of company. In a nutshell, this type of experience is totally unique for me, and add color in my skills. Furthermore, I am an optimist, Problem solver and able to apply statistical methods in order to ameliorate manufacturing processes and enhance production standards. My core subjects are Machining Processes, Production Tooling and Design, Quality Management System, Lean manufacturing and Six Sigma. I have command on Solid Works, AutoCAD, Mat lab and Ansys. I would like to get an opportunity of interview in order to flex my muscles regarding skills and capabilities. In the end, I will expect a positive response from your side. Sample cover letter for civil engineer is available for civil engineering jobs, civil engineering internships, civil engineering vacant positions to apply and send resumes. 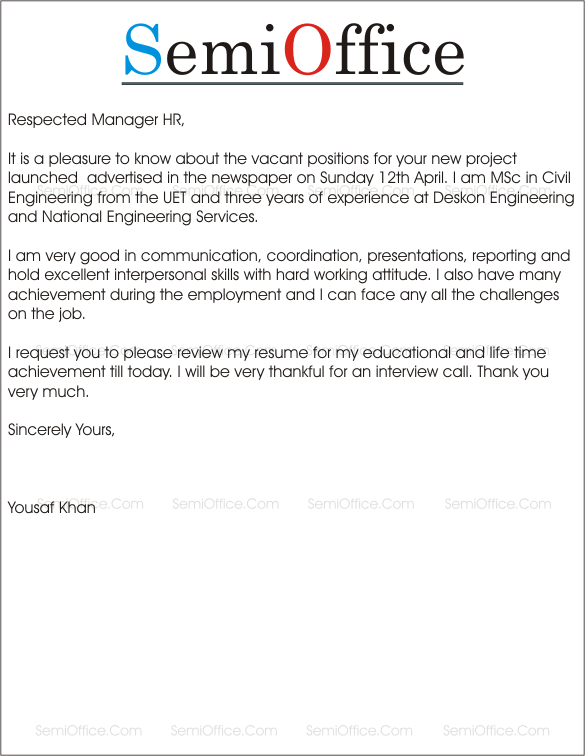 It is a pleasure to send my resume for the vacant positions for your new project advertised in the newspaper on Sunday 12th April. I am MSc in Civil Engineering from the UET and three years of experience at Deskon Engineering and National Engineering Services. I am very good in communication, coordination, presentations, reporting and hold excellent interpersonal skills with hard working attitude. I also have many achievement during the employment and I can face any all the challenges on the job. My document to support this job are attached with this letter. I request you to please review my resume for my educational and life time achievement till today. I will be very thankful for an interview call. Thank you very much. With reference to subject cited job in your company and the advertisement posted in this Sundays’ newspaper. I would like to know that my services are available for the mentioned job in your company any time your company wants me to join. I am a civil engineer graduated from a top university. I graduated in 2011 and working till now and having four years of field experience. Currently I am working as a junior engineer in structural design department in a construction consultancy company that provides both design and supervision services to the clients. It is a multinational company that requires great skill from their employees. My work here is to design feasible structural elements so that it is economical and bears the imposed stresses on them without any kind of failure. I have been working here for two years and having a sufficient experience required by the mentioned job. working here I have mastered the structural designing software that are essential nowadays for effective structure designing. These software helps in quick performance and reliable outcomes. I have worked at site for two years with the previous company as a site engineer and also having two years of execution experience. I consider myself perfect for the mentioned job as it includes design and site visits to check the execution at periodic basis. During this tenure I have been able to learn how to execute the plans that are drawn at designs without any mistake. I have learned to manage site and activities effectively. I have learned material testing and to achieve fast pace of work by managing resources effectively. I have the versatility for this job that makes me different and stronger than other applicants. I hope that you find me sufficient for this job. find here enclosed my CV for further credentials. Looking forward for an interview with you. 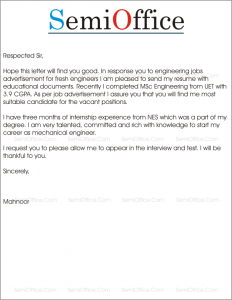 Sample cover letter for electrical engineer is available for download. This cover letter can be used to apply for engineering jobs in govt sector as well as private sector. I am pleased to send my resume for the advertised job in Newspaper and at company’s official website for consideration. I have done MSc Electrical Engineering from University of Engineering and Technology with 4 CGPA and earned 2nd position in the university. Right after the studies I have completed one year of Internship in Railway and and three months of job experience in a local powerhouse. I am very devoted and hardworking man with a pleasant personality and excellent communication skill in English, Hindi, Urdu and Punjabi. I request you to please provide me a chance to appear in the interview to prove myself a best candidate for the advertised engineering job. With due respect I would like to say that I have seen your ad for the post of an Electrical Engineer, I would like to tell you that I have done my BS in electrical engineering and masters in the same field. Sir I have 5 years of experience as assistant engineer tech department. I have attached my resume and transcript along with this application. I would like you to review my resume and give me a chance to serve your firm, looking forward for a positive response. Thanks. I have come to know through a reliable source that you are in need of Electrical Engineers to be posted at the newly opened Mall in Lakes View, Jumeriah area. I would like to present my services against this position as I have 6 years of working experience in the same capacity as Electrical Engineer at Abu Dhabi Mall and have been awarded the best technical staff for two consecutive years. Please find a detailed CV and consider me for the aforementioned position. If selected, I assure you of my complete dedication to satisfy the seniors. 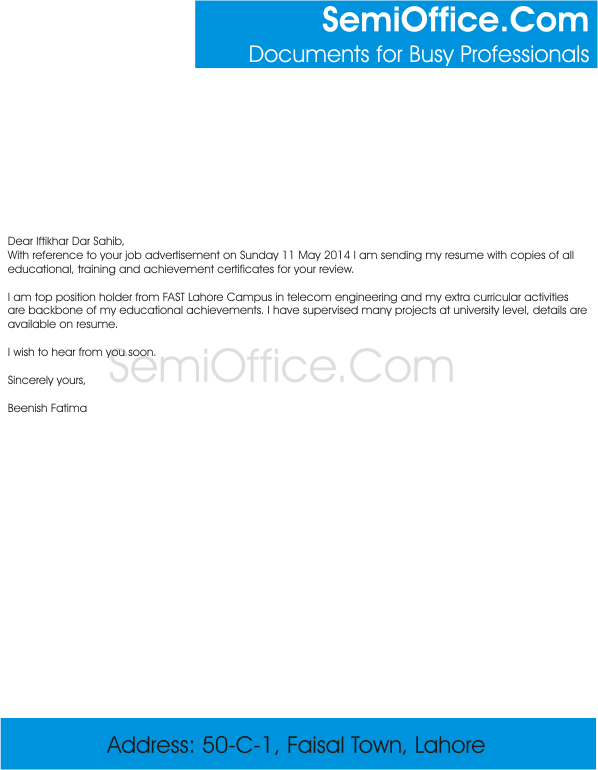 Sample cover letter for electrical engineering fresh graduate. Electrical engineer cover letter doc. Cover letter for electrical engineer entry level. Cover letter for engineering fresh graduate. I have done my electrical engineering from UET in 20XX and got 3.87 GPA. As I’m a fresh graduate and I know you won’t trust my skills and my education much but still I want to apply for this job to prove that fresher can do great as well . So please accept my application and call me for an interview. Trust me you won’t regret after that. 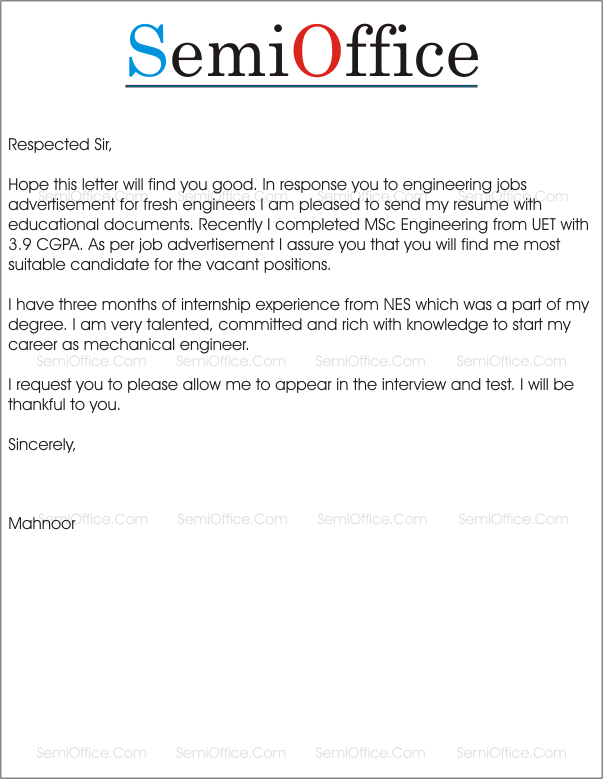 I am writing to you because I would like to apply for an electrical engineer position. I am a fresher just out of college. I do have the qualification needed but I don’t have the experience. I just need someone to give me that chance to gain this. I am a very good hard worker I learn fast and I love to challenge myself. I am very motivated and determined to succeed as I enjoy this career and am something that I would like to do for years into the future. I hope that you would give me this opportunity and help me climb the ladder to succeed. I look forward to hearing back from you. It is stated that I’m a fresh graduate of electrical engineering. I’ve completed my degree with 3.9 GPA and topped the whole batch of 20XX. As I’ve no work experience before so I want this job. It will be a huge favor for me. I hope you will complete my request. Sample Civil Engineer Experience Certificate Format for engineers, engineering companies and engineering firms, construction companies and civil engineers working at any position in the industry. You can print the below letter on the company letter head because experience letter are always be issued on official company letter heads. This is certified that Mr. Rahul Sudeep has worked as Civil Engineer at Geskon Pvt Ltd for 5 years starting from April 20XX. 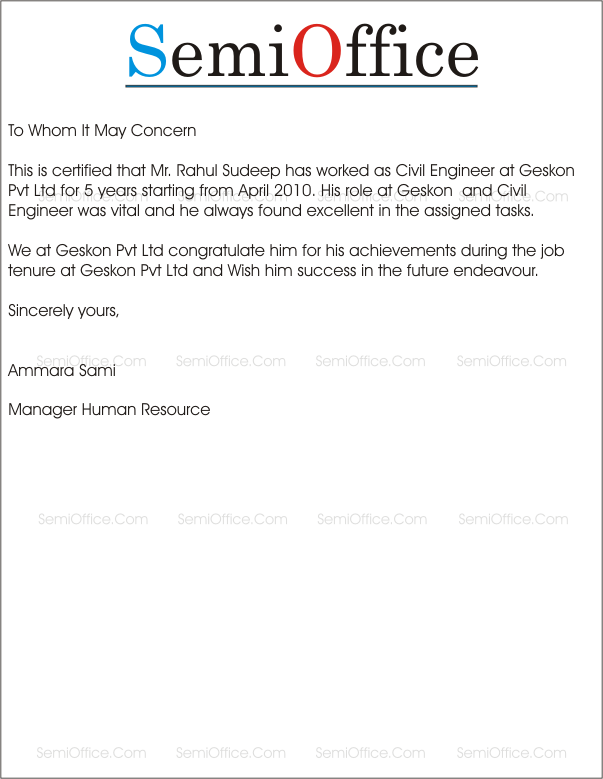 His role at Geskon and Civil Engineer was vital and he always found excellent in the assigned tasks. 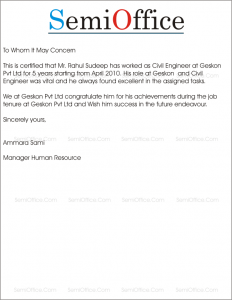 We at Geskon Pvt Ltd congratulate him for his achievements during the job tenure at Geskon Pvt Ltd and Wish him success in the future endeavor. We are pleased to certify that Ms. Ayesha Naeem was working at Harix Construction Company Pvt. Ltd., since three years starting from 15th November 20XX. She was hired as trainee civil engineer and due to her excellent performance and efficient working style she was promoted as General Manager Civil Engineering. She was very committed to her job and very good in coordination across the engineering departments. We wish best in her future career. 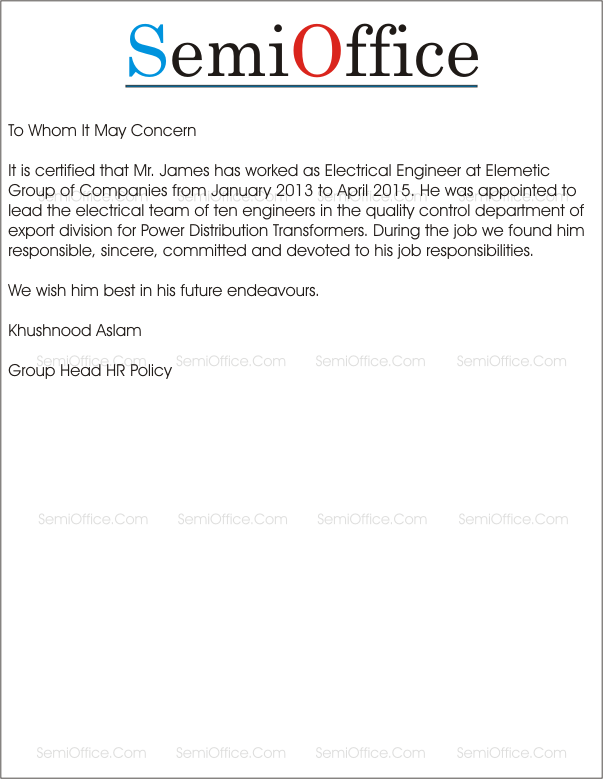 Sample experience letter for electrical engineers from companies or employers in word doc and pad files. Electrical engineering is becoming common day by day and mostly top educational universities are offering electrical engineering degrees. 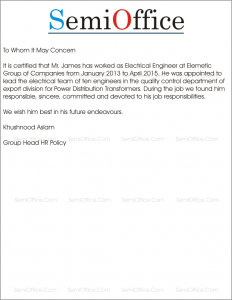 It is certified that Mr. James has worked as Electrical Engineer at Elemetic Group of Companies from January 2013 to April 2015. He was appointed to lead the electrical team of ten engineers in the quality control department of export division for Power Distribution Transformers. During the job we found him responsible, sincere, committed and devoted to his job responsibilities. We wish him best in his future endeavors. It is verified on behalf of Electric Electronics Company that Mr. James was a part of our Electrical Engineering division. He was appointed as team leader to lead and monitor a team of ten engineers responsible for Quality Control and inspection of installed electrical components. He has extensive knowledge of his subject and has good command on installation of delicate electrical components. During his period of employment here, he has been a dedicated and capable individual with strong commitment to his work responsibilities. He has been a vital part of our Quality Control Department for three years and we strongly recommend him for any future appointments. Our best wishes are with him for his future endeavors. It is certified that Ms. Ayesha Yousaf was permanent employee of Geskon Engineering since 2004 and submitted her resignation in February 2015 for career growth. She was a very good employee of the company and she always be remember for her pleasant and cooperative personality. We wish her best growth in the future. It is hereby certified that holder of this certificate has worked in company for more than 2 years as Electrical engineering. During his stay at the company he has proved himself to be a valuable asset to the company. His dutifulness and proficiency at his work is unquestionable. 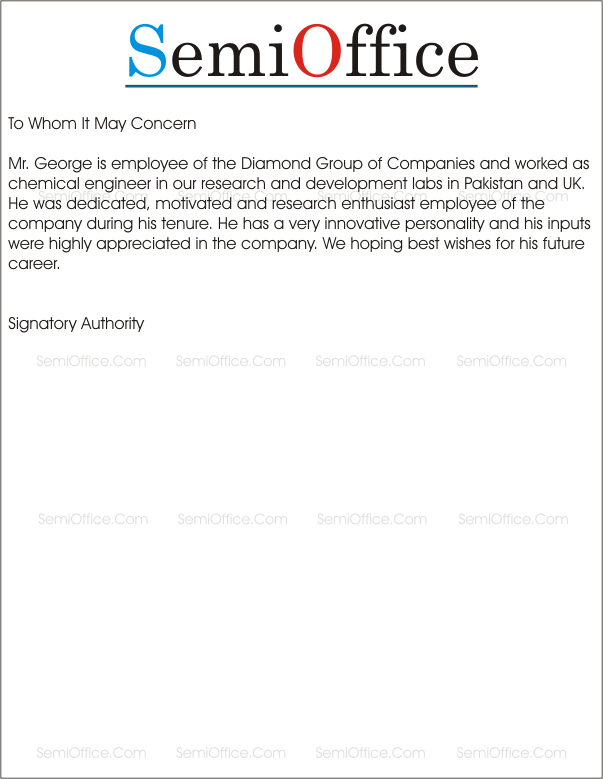 Holder of this letter has worked in many fields in the company under different projects. He is well-qualified and capable to perform simple or complex tasks. He has shown exceptional skills in electronics and circuit related issues. He is endorsed by our company to the job he may be applying. Sample job application for telecom engineers and trainee engineers available for free download. This application can be used for telecom engineer jobs in Pakistan, India, Australia, UAE, USA, UK and Europe in telecom sector. With reference to your job advertisement on Sunday 11 May 20XX I am sending my resume with copies of all educational, training and achievement certificates for your review. I am top position holder from FAST Lahore Campus in telecom engineering and my extra curricular activities are backbone of my educational achievements. I have supervised many projects at university level, details are available on resume. I wish to hear from you soon. I am writing to you because I saw that you are looking for some experience telecom field engineers. I would like to apply for this position. I do have good experience with telecom as I have worked for BT this was fitting land phones, Wi-Fi and TV satellite cables as well. I was the team leader of telecommunication field engineers. This is not the only experience that I have. I can provide for you some valid references and you will find attached my up to date CV with all of my contact details if you need them. I look forward to hearing back from you. Many thanks.